The battle over who controls your access to on-demand TV, apps and internet streaming services in your living room stepped up a gear this week with two platform operators announcing new ways to watch their services. First of all, Sony has announced it's partnering with YouView. It's 2015 range of Bravia TVs will include the YouView service and interface, which offers a roll-back TV guide and on-demand players from major broadcasters. The 2015 Bravia series includes twelve 4k UHD TV models, in preparation for YouView's long-awaited entry into 4k TV. Sony's rival Panasonic went with Freesat's Freetime service for its smart TV interface last year. And Freeview is planning to launch its own connected service later this year. Chinese manufacturer Seiki is to produce TVs with the connected Freeview service. Meanwhile, Sky is preparing for a new Now TV Box to launch later this year, with rumours that it too could be 4k compatible. 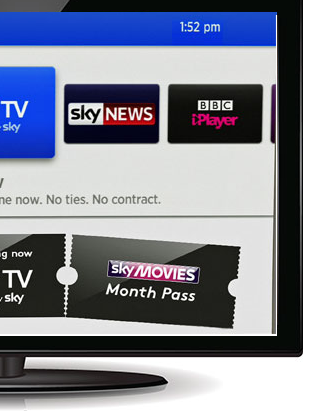 The current Now TV Box is based on an old Roku model and streams Sky's Now TV content, which includes Sky Atlantic, Sky Movies and Sky Sports at 720p. Newer Roku boxes can already handle 1080p - so even a move by Now TV to launch a 1080p box based on 2014 Roku models and to launch full HD streams let alone 4k will be welcomed, especially by those who already access Now TV using a box that can already do 1080p. Now TV is credited for helping reduce Sky's overall subscriber churn, which according to figures released today is at a 12 year low. The service provides Freeview and Freesat viewers with an option to add extra Sky channels via the internet on month-by-month basis. The Now TV box also includes access to on-demand TV, including the BBC iPlayer, 4oD and Demand 5, plus various smart apps. However for consumers, these developments mean that the confusing array of connected TV options will continue, with wildly different ways of accessing on-demand and streamed internet content and different prominence applied to UK commercial and public service content on smart TV platforms. Is Youview still a thing? Certainly wouldn't think it would be a selling point when buying a new TV! Why not? It's pretty good. It has all the normal players including Quest and UKTV. It has backwards EPG and Connected Red Button. It also has Now TV, Sky Store, and Netflix. Certainly a step up from normal Freeview. I would however like youtube app and perhaps more openess so other developers can add apps. I already have a brand new Sony TV I bought in 2015. It doesn't have YouView. Is it likely to get a software updated to provide it? No. It will be the new range only. That's the trouble - there is no reason most of these internet TVs can't be upgraded to include newer features, but sadly the market will ensure that your Smart TV isn't as smart as the next TV on the block. P.S. re: the backwards EPG - do you use it much as although it sounds good I've always thought it sounded a long winded way to actually find a show you want unless it's aired pretty recently.